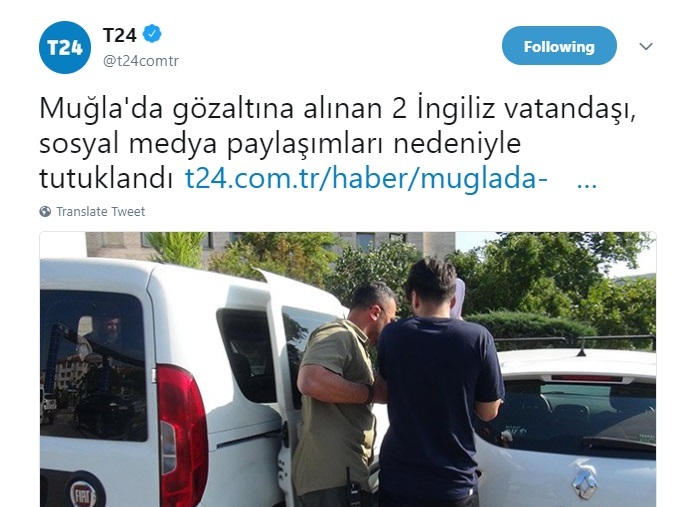 Two British citizens who were detained by Turkish police at Dalaman Airport in the tourist resort of Muğla on Thursday due to their social media posts were subsequently arrested on terror charges, the T24 news website reported. The two brothers of Iraqi origin, identified as Ayman Barzan and Hariam Barzan, were stopped by the police because they looked “suspicious.” Police officers seized the brothers’ mobile phones and examined their social media accounts. The Barzan brothers were taken into custody on accusations of disseminating the propaganda of a terrorist organization on their social media accounts. The name of the terrorist organization in question was not revealed. The brothers were later arrested by a Muğla court where they appeared later in the day. The arrest of Turkish nationals as well as foreigners over their social media posts is common in Turkey, where the government is receiving widespread criticism for silencing dissent and curbing freedom of speech.